Invented in 1908, the 380 ACP was originally designed for a pocket pistol, but has since branched out into several firearms. This light round is great for small conceal carry firearms and recoil sensitive shooters. Used through both World Wars, this round has proven itself to be an effective and reliable cartridge. 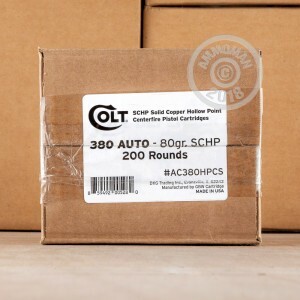 These 80 grain rounds from Colt are just what you need for your favorite 380 ACP firearm. 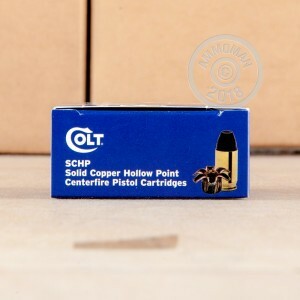 The solid copper hollow point projectiles offer penetration and expansion for self defense applications. 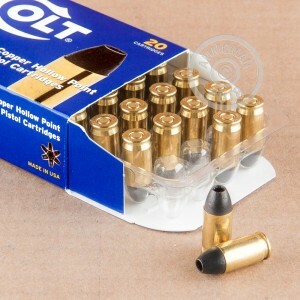 Colt loads these SCHP projectiles in boxer primed brass cases that are non-corrosive and re-loadable. Don't forget, at AmmoMan.com all orders over $99 qualify for Free Shipping! So stock up and save!